Magseed is designed to replace the guidewire system that we use currently and enable the surgeon to locate and remove cancers that are too small to feel. Approximately 1/3rd of breast cancers are diagnosed (eg by routine screening mammograms) when they are still too small to feel. Currently on the morning of surgery, the patients are sent from the ward down to the breast care unit and have a guidewire inserted into the cancer under ultrasound or Xray guidance. The wire is then coiled up under a dressing and the patient goes back to the ward and waits for their operation. The guidewire has to be placed on the day of surgery because it can become dislodged if it is left too long. It is not pleasant for the patients to have a wire sticking out of their breast, even if only for a short time pre-operatively. If Magseed is placed before the day of surgery, the patient may be scheduled first on the operating list and so be more likely to be discharged home on the same day. 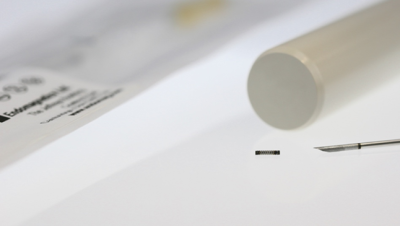 The Magseed is about the size of a grain of rice and made of surgical grade steel and sterilised. It can be injected into the breast by the radiologists under either ultrasound or Xray guidance up to 30 days before the patient’s breast cancer operation. In the operation the surgeon uses a handheld probe called Sentimag to find the location of the Magseed in the breast. Sentimag works like a metal detector but the technology inside is actually more like a handheld MRI machine. From the skin surface, the surgeon can detect the location of the Magseed in the cancer and then plan the incision and operation accurately. This is an improvement on the wire because although it is obvious where the guidewire enters the breast, the entry point can be quite a way from the cancer itself. With Magseed we can remove the cancer just as effectively as we do with a guidewire but with less dissection to access the right area, we are causing a smaller “injury” and so we hope our patients recover better as a result. The Breast Care Leicester surgeons, Mr Pilgrim & Miss Kaushik, along with Dr Hoosein and a colleague have introduced Magseed to Leicester by way of a pilot study at UHL of 10 Magseeds, which have been donated by the suppliers, Sysmex UK and EndoMag. We are especially grateful to those patients who have helped to draft our patient information as well as the patients who have volunteered to take part in the pilot. As of 13/2/18, we have used 5 Magseeds successfully. We have even had interest from our surgical colleagues in other specialties with ideas for potential applications in lung cancer treatment. Although the cost of each Magseed is more expensive than a guidewire, we think the improved patient experience and the improvements to efficiency in clinic and theatre will offset this to a large extent. Once the pilot is complete we hope to use Magseed routinely instead of the wires at all our hospital sites. 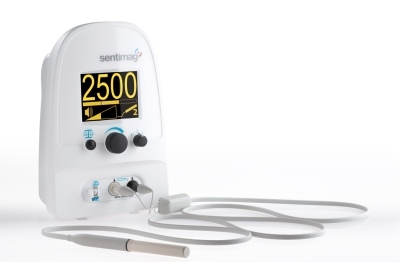 Wires will still need to be used in some patients, for example those with pacemakers as the magnetic field of the Sentimag probe could interfere with the functioning of the pacemaker unit. Magseed is not intended to improve breast cancer outcomes or survival. As a team we are constantly working to try to improve our outcomes but it is just as important to improve the experience of our patients while they are being treated. We believe Magseed will improve the patient experience for those patients who would otherwise be having a wire. There are likely to be some interesting developments in breast cancer treatment in the next one or two years, particularly in reducing the number of lymph nodes we need to remove from the axilla (armpit) as part of breast cancer surgery after chemotherapy. Subject to licensing approvals, we already have some ideas as to how Magseed could be used in this setting as well. Images from EndoMag promotional material with thanks.